Sailing across the Atlantic Ocean in January, Kirk Kelly was prepared to battle hurricanes, trade winds and equipment failure on a voyage from Europe to Grenada. But not everything he encountered showed up in the weather forecast, including two 9-year-old girls who joined him on the trip. Sailing Director Kirk Kelly, left, speaks to the sailing instructors, including his son Thomas Kelly, right, Thursday, June 23, 2016, at John R. Turney Sailing Center. The instructors were cleaning and rigging the boats in preparation for the start of the season. Photos: Mike Clark. 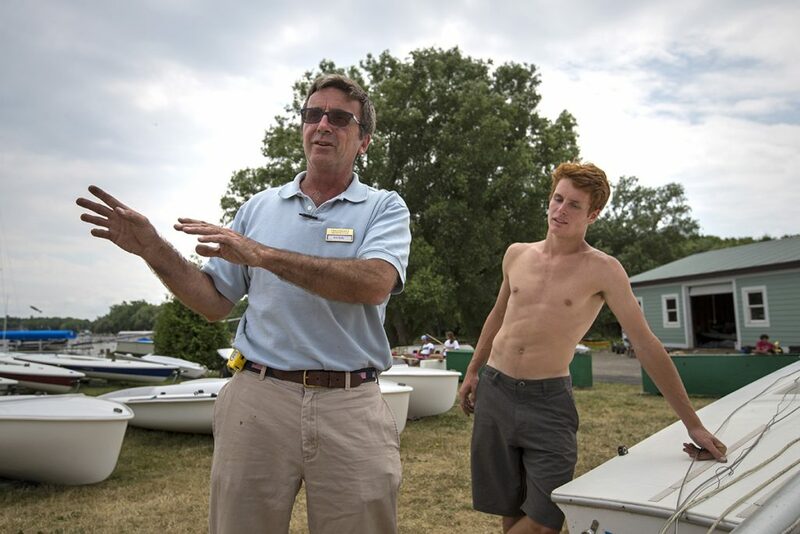 Kelly will be able to draw on the experience in his first year as Chautauqua Institution’s sailing director, during which he said working with children will be a primary goal. Although this is Kelly’s first year at the helm of the sailing Department, he has been a member of the Chautauqua community for almost two decades. His wife’s family owns a home on the grounds, and Kelly spent several years operating a children’s clothing store in the Colonnade. But sailing has always been an integral part of his life. Kelly was a founding member of the Chautauqua Lake Community sailing Foundation, a sailing program in nearby Lakewood that he helped to establish in 2015. It took only one year for the foundation to produce a New York state Championship high school sailing team. Kelly learned to sail on his family’s beloved boat, Take Ten (he is the youngest of 10 children). His passion for the sport becomes obvious when he recounts those memories, and is just as apparent when he talks about encountering marine life during his Atlantic crossing. 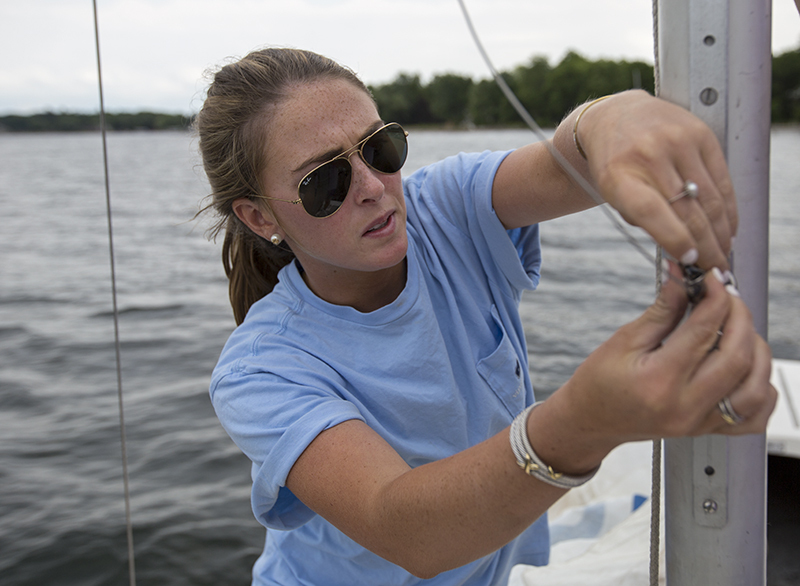 Kelly spent a recent Monday afternoon at the John R. Turney sailing Center preparing for the beginning of the 2016 season, while just a few yards away, sailboats glided across the surface of Chautauqua Lake. with new instructors in the process of completing their training, Kelly has spent most of last week training the new arrivals and helping out around the sailing center. Kelly said that not enough people realize the tremendous recreation opportunities that Chautauqua Lake can provide. Sailing instructor Nick Rowe holds a sailboat boom Thursday, June 23, 2016, at the John R. Turney Sailing Center docks. The instructors were cleaning and rigging the boats in preparation for the start of the season. By building a passionate and dedicated staff, Kelly said he hopes to cultivate a love of sailing among Chautauqua’s younger generation. “Sometimes a capsized boat can be traumatizing, and other times it can be the most fun time they had during the summer,” he said. During his Atlantic crossing this year, Kelly experienced firsthand the kind of challenges sailing can provide. when the autopilot on his boat failed, Kelly had to steer the 54-foot vessel for 12 hours while his friend repaired the technology. On a different occasion, the boat’s generator overheated, forcing Kelly to reverse the flow of a bilge pump in order to cool off the machinery. He said sailing requires knowledge of how everything on the boat works and the ability to make the necessary repairs. 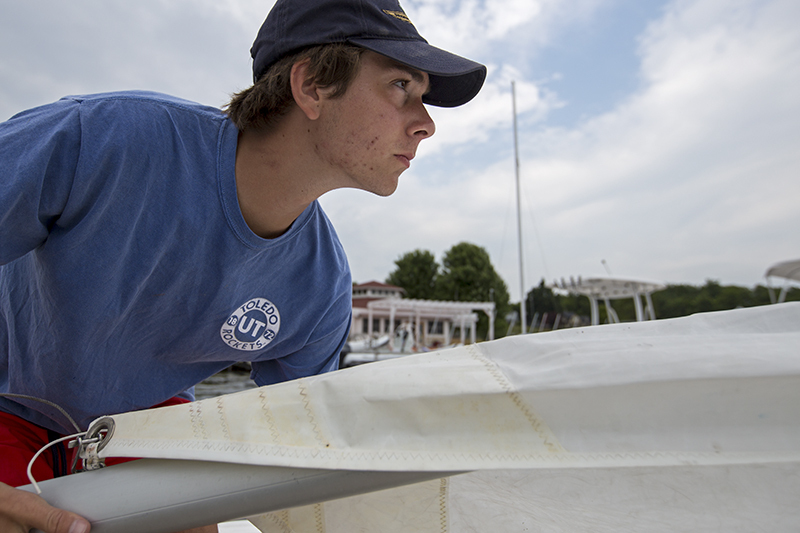 It’s the sort of training Kelly hopes to provide this summer and the passion for sailing that he brings to Chautauqua.